Though there are similarities to HP, I found this to be nothing at all like HP. It’s it’s own story-line and it was very good! I really loved this book and can’t wait to find out what will happen next!!!! What’s The Iron Trial about? 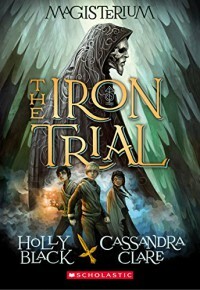 It’s about a group of kids who start out by going to a testing to see if they will get picked to go to the Magisterium and be apprentice under the Masters. Callum’s father has told him all his life about how bad magic was and that he needs to do his best to fail the test so he can come home. So Callum tries his best to fail but gets picked anyway. Call knows nothing about magic yet he is picked by one of the greater Masters to study under. This causes a rift between him and another kid who wanted his spot. Their are two others that are studying under the same Master.Tamara and Allen both who were top of the leader board on the testing. Since Call knows nothing about magic he also knows nothing really about the history of magic or exactly how his mother died. He learns about the Enemy of Death, he is a Makar who went bad. They have went to war with him a few times and right now they have a treaty, but the Masters are on the look out for another Makar who will be able to hopefully one day defeat him. Call and his friends learn how to use their magic and Call learns that he sort of likes magic and feels conflicted because his father hates it. He also learns some things about himself that his father has told him about. It has some great twist and turns in the story and the ending is what really has me wanting to know what happens next. Although there are some similarity to Harry Potter as everyone seems to lash out about, I found it to be nothing like HP. If I went on similarities to this book or that book, then I am afraid I would never read a book again. So just because this book contains children, magic and a villian doesn’t not make it a Harry Potter rip off. Okay now that that is off my chest.. I loved this book!! I loved that it’s about elemental magic, no wands here. They use there minds and the elements to do their magic. Most of them can call upon Earth, Wind, Fire and Water but there are a few select that can use Chaos. Those that can use Chaos are the Makar. Call’s story is interesting. I find talking about this book difficult as I don’t want to give anything away. I found it interesting that he comes from magic but yet knows nothing about it because of his father. His father blames the mage for his wifes death and now wants nothing to do with them or the Magisterium. So pretty much everyone else knows exactly what they are going into and Call has no clue. I love how I thought I knew how things were going to go until the last proabably 30% or so and I was totally thrown for a loop. If you think you might know how this book is going to go without reading it then I bet you don’t. Not a dag-gum thing! That is my hillybilly speak for I didn’t really find anything in it that I disliked. I totally loved the last part of this novel even though it does leave you wondering what is going to happen and you might think it’s a little cliffy, but not sure how else it could have ended. So well done! If any of you follow my reviews you probably know I dont gush that much about a novel, but I really enjoyed this one. Not going to say that everyone will be like me, but what is stopping you from giving it a try!! It’s a great novel IMHO and if you like middle grade fantasy books with cool magic then I think you will enjoy this one. So put aside your snarly it’s a HP ripoff and give it a try before you snarl then if you don’t like it, snarl away.